Pour la 2ème année, le CHATEAU LAMBERT participe au Salon des Vins et de la Gastronomie à Rennes. Nous vous donnons rendez-vous au parc des expositions vendredi 31 octobre, samedi 1er novembre, dimanche 2 novembre de 10h à 20H et lundi 3 novembre de 10h à 18h. 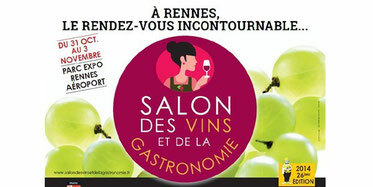 C'est avec grand plaisir que nous vous accueillerons sur notre stand (C 04) pour vous faire déguster quelques-uns de nos vins. Pour bénéficier d'entrées gratuites, télécharger le document ci-dessous. N'hésitez pas à en faire bénéficier vos amis ! I'm impressed, I have to admit. Rarely do I encounter a blog that's both educative and amusing, and without a doubt, you have hit the nail on the head. The problem is something too few folks are speaking intelligently about. I'm very happy I stumbled across this during my hunt for something concerning this. Your style is unique in comparison to other folks I have read stuff from. Thanks for posting when you have the opportunity, Guess I'll just book mark this page. Hello Dear, are you in fact visiting this website on a regular basis, if so then you will without doubt get nice knowledge. Have you ever considered about including a little bit more than just your articles? I mean, what you say is fundamental and all. Nevertheless imagine if you added some great graphics or videos to give your posts more, "pop"! Your content is excellent but with pics and video clips, this site could certainly be one of the best in its niche. Excellent blog! Heya! I understand this is kind of off-topic however I had to ask. Does running a well-established blog like yours require a massive amount work? I'm brand new to operating a blog however I do write in my diary everyday. I'd like to start a blog so I can share my personal experience and views online. Please let me know if you have any kind of suggestions or tips for brand new aspiring bloggers. Thankyou! Wow, awesome weblog structure! How long have you ever been blogging for? you make running a blog glance easy. The entire glance of your website is wonderful, as neatly as the content material! Hello there, There's no doubt that your website might be having browser compatibility issues. Whenever I take a look at your blog in Safari, it looks fine however, when opening in I.E., it's got some overlapping issues. I just wanted to provide you with a quick heads up! Aside from that, great website! Nice answers in return of this question with solid arguments and telling all regarding that. Hmm it seems like your website ate my first comment (it was extremely long) so I guess I'll just sum it up what I had written and say, I'm thoroughly enjoying your blog. I as well am an aspiring blog blogger but I'm still new to the whole thing. Do you have any tips for newbie blog writers? I'd certainly appreciate it. I've been surfing online more than 3 hours today, yet I never found any interesting article like yours. It's pretty worth enough for me. Personally, if all website owners and bloggers made good content as you did, the internet will be a lot more useful than ever before.